Available in three sizes, this urn is cast from polymer materials and then hand-painted to simulate two natural wood tones. 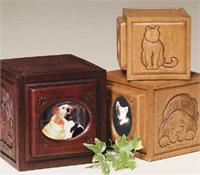 Each urn has a relief of a cat on one side, a dog on another side with two sides being plain. 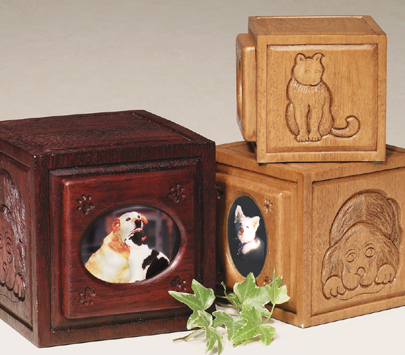 Photo frame (included) is self-adhesive to any surface of the urn. Closure: Bottom stopper and adhesive. Photo Opening: 2.125"W x 2.625"H x .375"
The two other sizes available in this urn can be found in our cat and large dog urn departments.